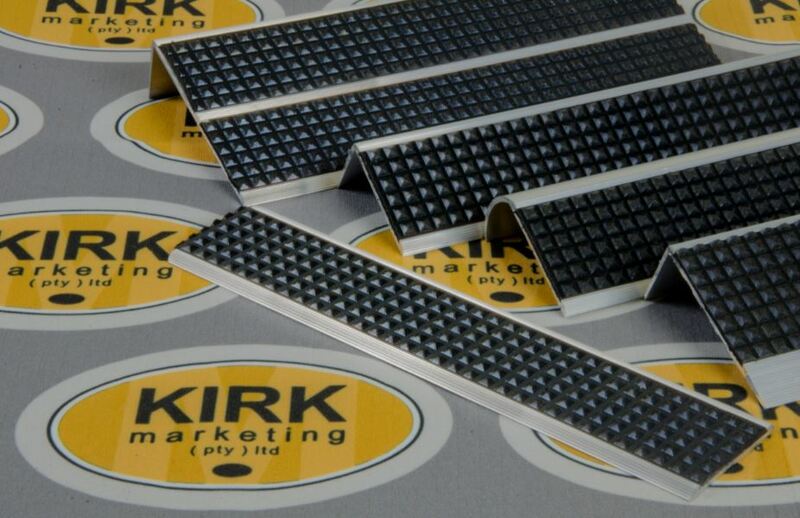 Kirk Marketing noticed a gap in the final floor solutions market and the brand’s R&D department has responded by creating and launching a new all-weather multipurpose stair nosing and tread range in the M.Trim brand of profiles. The diamond tread is a rubber infill with anti-slip pyramids that provides high slip resistance in dry, wet, powdery conditions. Perfect for commercial applications internally and externally. The insert, which can be used in residential and commercial applications, is self-adhesive and very easy to install. The insert is made from SBR rubber and it has good compression, excellent abrasion resistance, good tear resistance and excellent impact resistance. It is black and used in five retrofit stair nosing options: 62mm and 45mm wide single stair nosing, 52mm wide single bull stair nosing, 85mm wide double stair nosing and the 45mm wide tread. The anti-slip diamond rubber insert can also be used on its own on ramps and in areas that require non slip strips. It is a heavy-duty product, long lasting and easy to fit in any anti slip required areas. The infill can be used on glazed and sealed tiles and hard surfaces. For more information, contact Kirk Marketing on +27 (11) 444 1441 or via www.kirk.co.za.